Every big Italian family has an Aunt Marge, the matriarch who holds everything together. My mom is the ninth of ten kids. Aunt Marge was up around number 2 or 3. She was always old when I was growing up. She was married to my Uncle Woody who worked about 50 years in the coal mines of southwestern Pennsylvania. His biggest gripe was that the sportscaster on the news never gave the studio wrestling results, which he was certain were “just as real as the Pirates and the Steelers”. Aunt Marge’s main mission in life was to keep Uncle Woody alive, and to try to feed anyone who’s path she might cross. She could whip up a Thanksgiving feast on a whim, and always told you “how skinny you look”. At any given time, she had several vats of wine fermenting made out of everything but grapes, along with sausage, tomato sauce, and tons of garlic. Oh, and she pickled anything she could get her hands on. I’m sure this is where I get my love for pickling. I went to her house about a year before she died, and she pulled out this quart jar of pickled banana peppers which she had stuffed with sauerkraut. Sounds terrible, but tasted great. I asked her for some, but she said it was her last jar. A buddy of mine had this huge garden with about 70 pepper plants. I brought her about a half-bushel of peppers, and she put up her last batch. 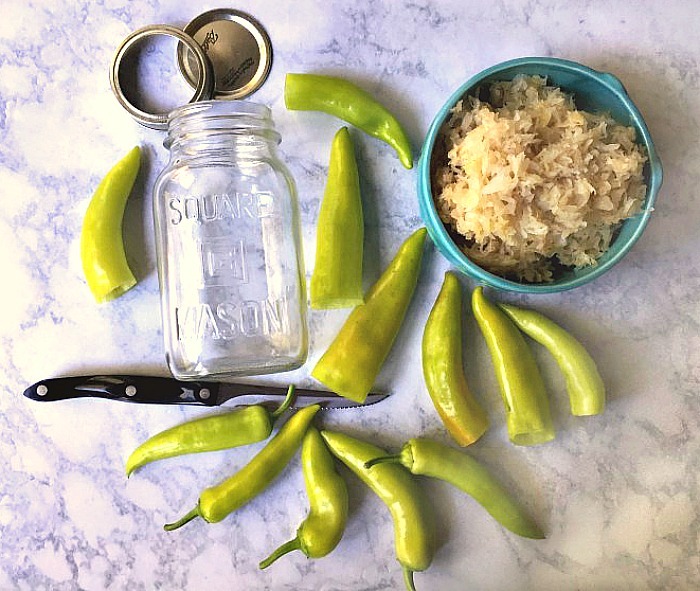 I haven’t had them since about 1980, but as the fall weather started to turn the banana peppers bright yellow and red, I decided to channel Aunt Marge and make her pickled peppers stuffed with sauerkraut. Peppers are easy to stuff. You just cut off the top and clean out the seeds. I put regular canned sauerkraut into the yellow peppers, and some red sauerkraut that Denise had in the cupboard into the red ones. I cut up some cayenne and jalapeno peppers for a little spice and some color contrast. I then used my cold pickle recipe and put them into quart canning jars. The results are pretty striking, but the best is eating them. The spicy-sweet-sour combination is great for a snack, or as a side dish for dinner. 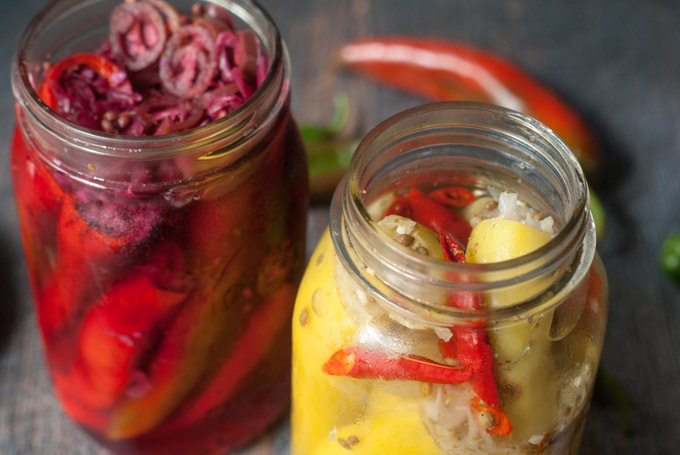 Winter is Coming – But I’ll Have My Pickled Peppers! And, my Aunt Marge would be proud. When I was about 12 years old, I used to spend a week or two each summer at my Grandpap’s house. I’d work in the yard, we’d have supper, then listen to the Pirate game on the radio while playing bizarre Italian card games. He was dedicated to his garden which could feed a medium-sized third world country. He gave away tomatoes, peppers, onions and garlic to anybody who asked him. Aunt Marge was too proud to ask. One day I was in the yard trimming hedges when Uncle Woody drove up. He came to the garden and told my Grandpap, “Pete, let’s go to the Legion for a beer.” So off they went while I kept at it. Not five minutes later, Aunt Marge drives up with three big brown paper shopping bags. She quickly goes from plant to plant gathering all manner of produce, but being very careful to take them evenly, so at a glance it wouldn’t be obvious. Quick as a flash, she packed up her booty in the car and drove off. Sure enough, five minutes after that Uncle Woody dropped off the old man. He walked into his garden looking intently. I’m sure he had a sense of where every vegetable was, and came away shaking his head. Well, I did it. I ratted out my aunt. He went into a unprintable string of Italian swear words ending with, “Margot! I knew it!! I knew she was taking them!! !” Apparently this scam was going on for quite some time. Aunt Marge and I never spoke of it. Oh aunt Marge! Steve has a friend at work that makes sauerkraut stuffed peppers and he thought it was a German thing. I’ll have to let him know you have some! My peppers went nuts this year Amy. By the end, I was looking for anything to try with them. Then I remembered Aunt Marge’s stuffed peppers. I must try the recipe. Thanks Nikki. Having a big Italian family give me a wealth of stories like this. Great for blogging. Oh my goodness, this sounds amazing! And I love the stories about your family. My Italian grandfather and his Portuguese brother-in-law had gardens like that and could grow anything. I wish they were around for many reasons, but sometimes just so I can ask them what I am doing wrong in the garden. My peppers really like epsom salt mixed into the soil, so I put some in after the fall freeze. Pennsylvania hasn’t had a frost yet so my patch is still producing. The upside of global warming! This recipe looks so good. I might have to wait until next years pepper season to try it. But, it will be topping my list. Thanks for sharing at the #InspirationSpotlight party @DearCreatives Pinned & sharing. These are really great to snack on. My wife Denise tries to keep us all off the carbs, so making the pickle with Splenda instead of sugar helps. I like to slice them into rings. A good savory snack. 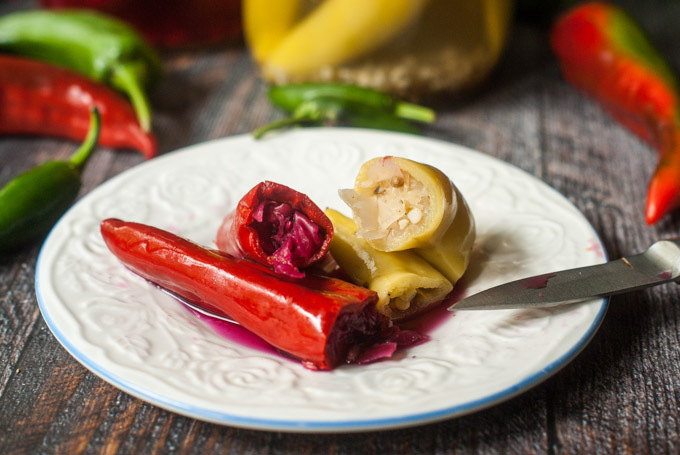 This is a first for me, I have never had pickled peppers stuffed with sauerkraut, but it sure sounds good. I can’t wait to try this recipe! Thanks so much for sharing with us at Full Plate Thursday this week. Hope you are having a great week and come back to see us real soon! I like to eat these as a snack. I cut the pepper into half-inch rings with a sharp knife so the kraut stays put.